Vancouver's skyline of skyscrapers has earned it the moniker 'City of Glass' but one building, in particular, is a favorite postcard view of the city. Canada Place's white billowing 'sails' are an iconic part of Vancouver's cityscape, and the waterfront landmark both blends in with the adjacent cruise ships and stands out as an innovative design. Best viewed from the North Shore or along the downtown Seawall, Canada Place is a popular hub for tourists and locals alike. The host of events from Canada Day celebrations to outdoor Zumba classes, Canada Place is a focal place for festivals, as well as being home to attractions such as FlyOver Canada. 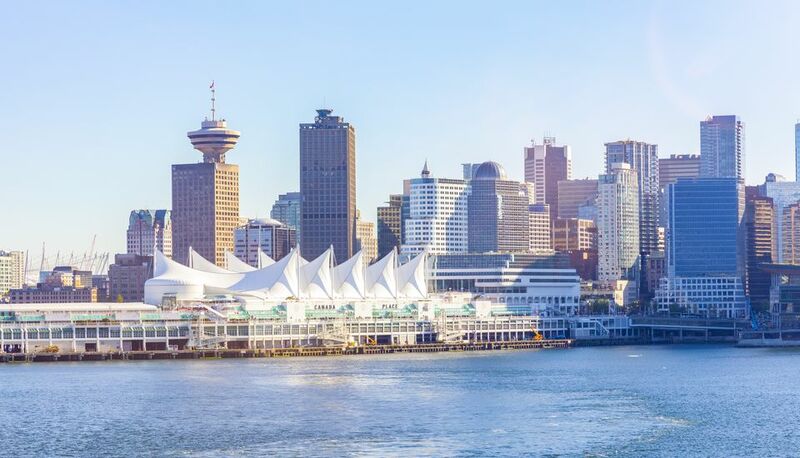 Situated in the heart of Canada's busiest harbor, Canada Place is the home port for Vancouver-Alaska cruises, and it also houses Vancouver Convention Centre East, Pan Pacific Hotel, the World Trade Centre, and WestPark car park. Canada Place is located on land that has been a major part of the city's history since the early days of immigration when the pier belonged to the Canadian Pacific Railway and acted as a link between international ships, especially trade ships from Asia, and the transcontinental railway. In the late 1970s, it was decided that the area would be the site of a convention center, cruise terminal, and hotel and that Canada Place would act as the Canadian Pavilion at the Expo ’86 World Fair. After hosting more than five million visitors during Expo '86, the Canadian Pavilion was converted into the Vancouver Trade and Convention Centre in 1987, and it was turned over to the people of Canada as a legacy from the government. Take a walk around the outside of Canada Place to view the iconic five sails. These mighty, 90-feet-high Teflon-coated fiberglass sails are illuminated at night when the Sails of Light projects seasonal colors onto the white sails. View it from the North Shore or Stanley Park for the best photos of the city at night. Stroll around the west promenade of Canada Place to discover The Canadian Trail and 'walk' across Canada from east to west and north to south. Thirteen sections represent Canada's ten provinces and three territories through tiles and colored glass along the way. Walking tours run between May and September; look out for guides along the trail. Learn more about the working port at the north end of Canada Place, where The Port of Vancouver Discovery Centre features animated infographics and videos about the port’s activities. Listen out for the Heritage Horns, which sound the first four notes of "O Canada" every day at noon and have been doing so for the last two decades. Take a trip across the country at the incredible FlyOver Canada attraction, which features a breathtaking flight simulation ride, complete with wind, scents, and mist. Rides begin with an audio-visual show about Canada before entering the flight deck for an eight-minute trip on the Ultimate Flying Ride where you virtually soar over stunning scenery. Look out for the nearby Dream of Canada photography exhibit while you're there. Canada Place is a working hub that is home to tourist attractions, the Pan Pacific Hotel, car park, cruise terminal, World Trade Centre and Vancouver Convention Centre East. Canada Place also hosts major events through the year from conferences and expos to outdoor Zumba and al fresco movies in the summer and huge Canada Day celebrations on July 1. Situated on the Seawall, Canada Place is at the foot of Howe and Burrard Street and is easily reached by foot or bike from the rest of downtown. Transit links bring buses and the Skytrains to the nearby Waterfront Station, and the SeaBus connects Waterfront to the North Shore. If you're driving to Canada Place, there is parking in the onsite 770 space WestPark, though it is also the parkade for the cruise terminal, so it can get busy. Visit the Welcome Centre in the Main Plaza (look out for the giant maple leaf). Operated by WESTCOAST Sightseeing, the Welcome Centre has information about attractions, tickets, and events, and it's situated near the bus pick up points for hop-on hop-off tours and free shuttles to attractions such as Grouse Mountain and Capilano Suspension Bridge on the North Shore. Mountains. Ocean. Socks & sandals. All part of Vancouver's beauty.